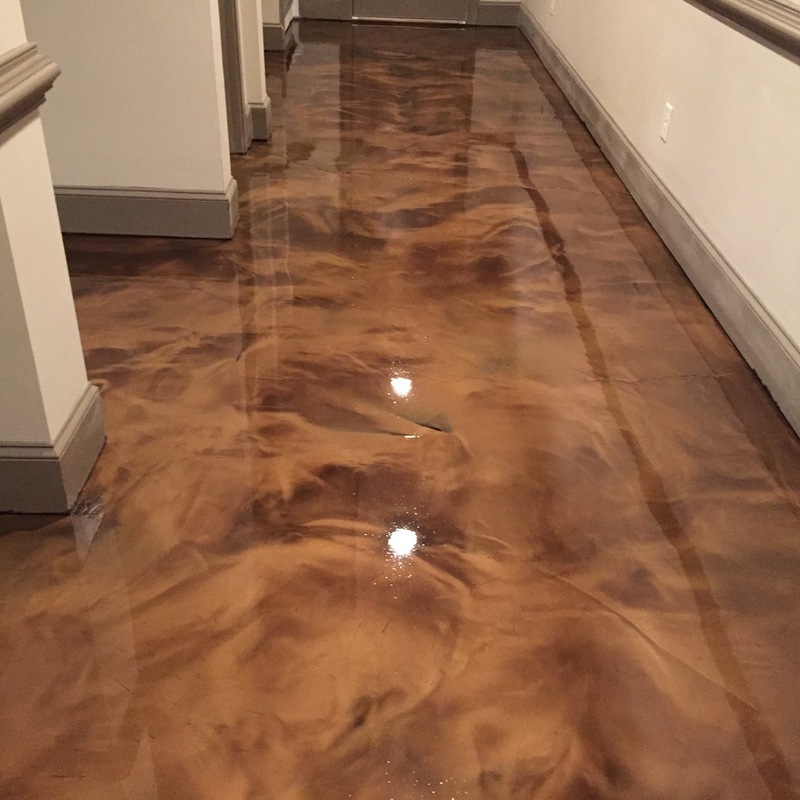 High-rise condo floors colored in dark brown and polished to high shine. Appreciating the natural beauty of concrete and aggregate. Also understanding that all concrete is it's own different mix! Fire station after grinding off glue, making repairs, coloring mid gray then full mechanical polish. Scoring lines in polished concrete surface to resemble tile grout. Restored with natural diamond polish. New construction. 3,000 SF colored in Bronze and Espresso and polished to 3,000 grit. Saw-cut 40' oval with runway, apply 18' corporate logo and polished to 3,000 grit. Surface polished to high clarity. Grind concrete to prepare profile. Apply base coat then metallic epoxy for unique look. Removed wood flooring, grind, hone, color floor in black then bring to full polish. Carpet removed, repair spalling and nail holes, grind the floor, mask borders for two different color browns. Polish to high clarity. Beautiful basement area with finished walls. We will grind, color and polish the concrete. Basement suffered from water damage on rugs. We needed to grind, color in two brown stains then seal with epoxy and urethane. County Courthouse dating back to 1939. Terrazzo needed restoration. A natural grind and polish. No need for waxes or coatings. A residential condo where all floors are concrete and very industrial in feel. Householder wanted stained two colors then sealed. A 2,000 SF barn to be polished and joints filled. A coffee manufacturer's warehouse where the floor could not be cleaned of tire tracks or soil. They opted to grind and polish. An 4,100 SF extension built at a facility with broom finish concrete. They wanted it polished. Marble floor with pet stains, etching and dullness. We mask all the walls to protect the residence prior to start. Three car garage of 850 SF that was about to get full flake epoxy system. Restaurant looking to fill all joints, grind and polish floor. This outside sandstone counter-top was stained and very dull. We had to hand grind with 50, 100, 200 up to 800 then seal. Florida residence with very soft concrete and thin-set. Three colors then sealed with epoxy and clear coat of urethane. Lightweight concrete on this building's 2nd floor covering 26,000 SF of area with thin-set and mastic. 12,000 SF of flooring with 30 years of black mastic glue covering entire floor. NOTE: Repairs in polished concrete, will be visible, so client must be realistic.